It has been a couple of weeks since I last posted, which is a little disappointing to say the least. Personal stuff has got in the way of things and the drug called Tramadol is not very nice even if it does do the trick and dull pain. I have gradually pulled myself back to reality and taking something which has less severe side-effects, so I am kinda back. Progress has been a little slower as I have explored many of the systems I have jumped into. Interestingly, one of these systems which is quite a way from the bubble, had been fully explored; so others have been in the vicinity and returned. 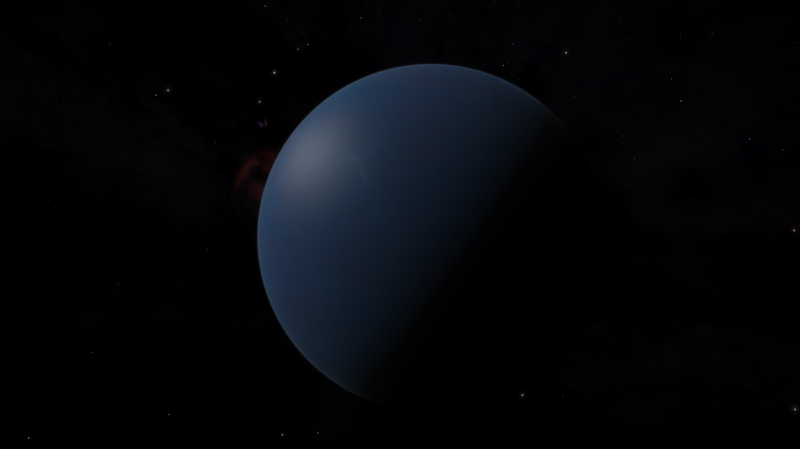 I think in a previous post I mentioned that the star field Synuefai was a little boring and many of the systems just had ice planets, but having now moved into Swoiwns star field, there seems to be more to look at. I think this more coincidental rather than a quirk of the Stellar Forge. So in this post, I have a lot more pictures that I think are worthy of posting. Some of these you feel to be a bit mundane, and as they say beauty is in the eye of beholder. 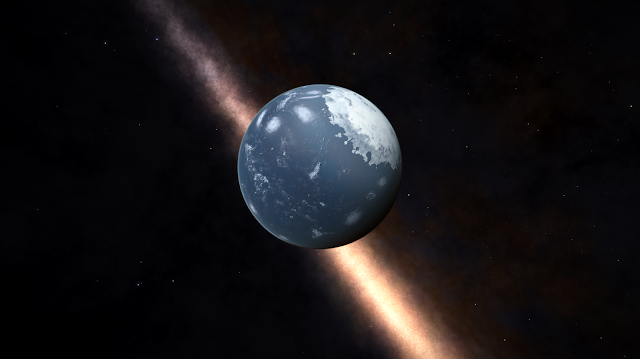 This Hi-Res picture is a simple water world, but what impressed me was the phong effect made by the solitary sun in this system. The further I move to the lower part of the spiral arm, the less dense the star field when facing open space. This can be seen in the picture by the lack of stars in the background. 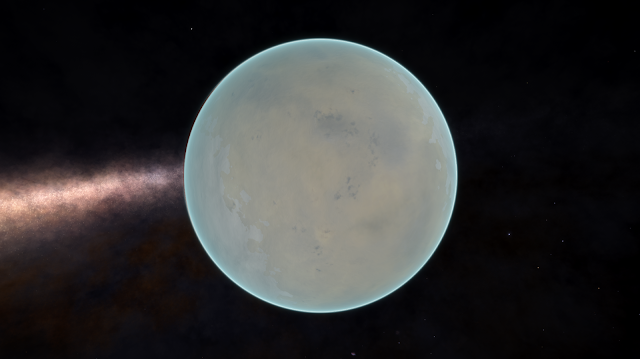 A metallic world with an atmosphere and silicate vapour geysers. The description says that the composition has 0.9% ice and it looks like that ice is in a single ice pack. 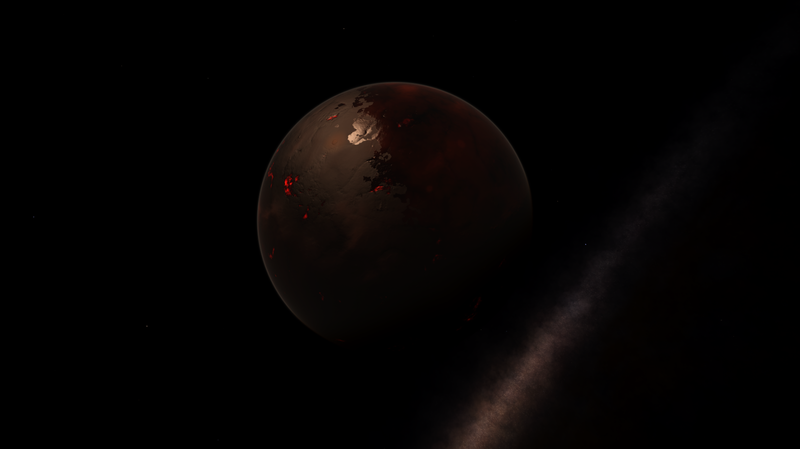 On previous bodies where there has been these type of geysers, the colour has been yellow-greenish areas rather than the red, but I suspect that volcanism is still ongoing. A wonderful water world with a massive ice cap. 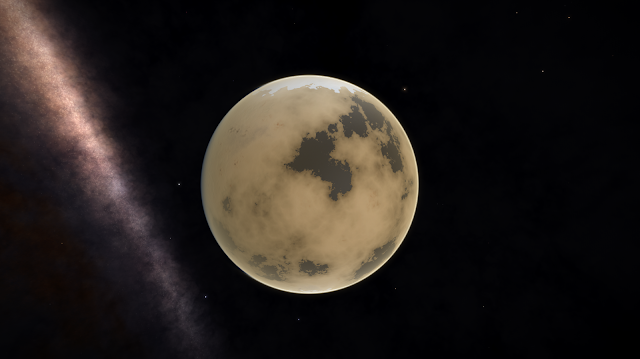 Whilst still in the Synuefai star field I came across a system that was perhaps one of the most interesting ones so far. There was much more than the usual lumps of rock floating around in space. The above water world was one of these, but one planet I just had to land on was very close to one of the suns in a binary system. 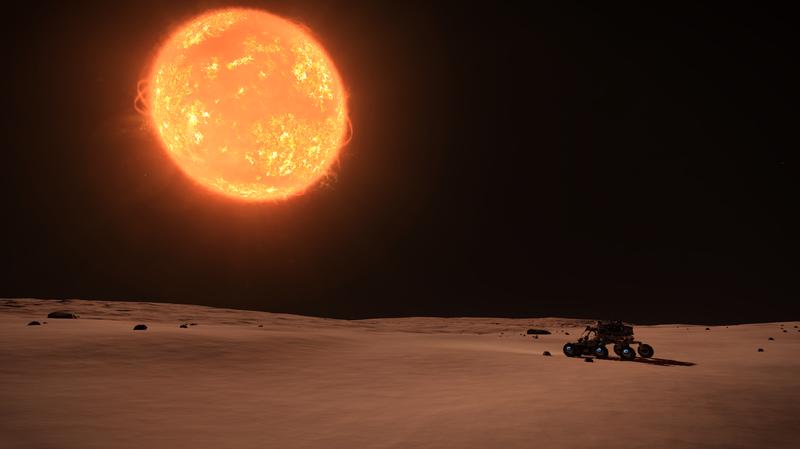 It would appear that the materials used to allow ships to get very close to suns to be able to scoop fuel, are also used on the SRV, or it would not survive on this kind of body. The surface temperature was said to be 1,068 Kelvin !!! I spent a little while here exploring and see what was available with regards to materials. This body was 100% metallic, so was well worth a look-see. It didn't produce much in as much as rare materials and most of it was iron, which I guess is hardly surprising. The semi major axis was 0.01 Au and the body had a radius of only 505 km so pretty small and could probably be considered as being a very large asteroid. 100% metallic bodies are not very rare, but having said that, they are quite uncommon. Still inside the Synuefai star field, wonderful planets worthy of exploration. 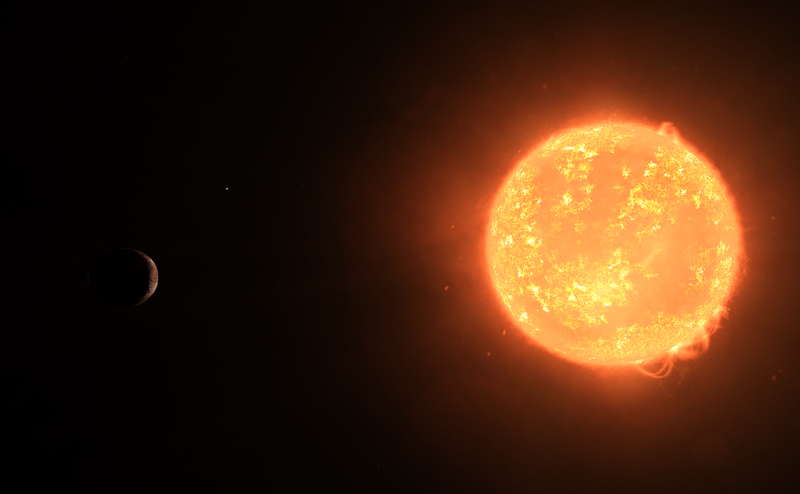 My first stop in the Swoiwns star field produced this body. Lovely atmosphere effects. If this is what planets can form further out, the trip will be most fascinating. 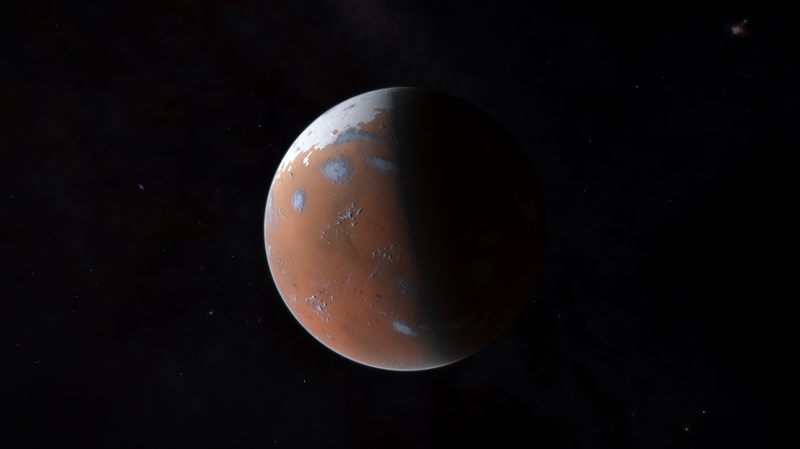 I guess this could be Mars like if one could compare it to anything in our Solar System. 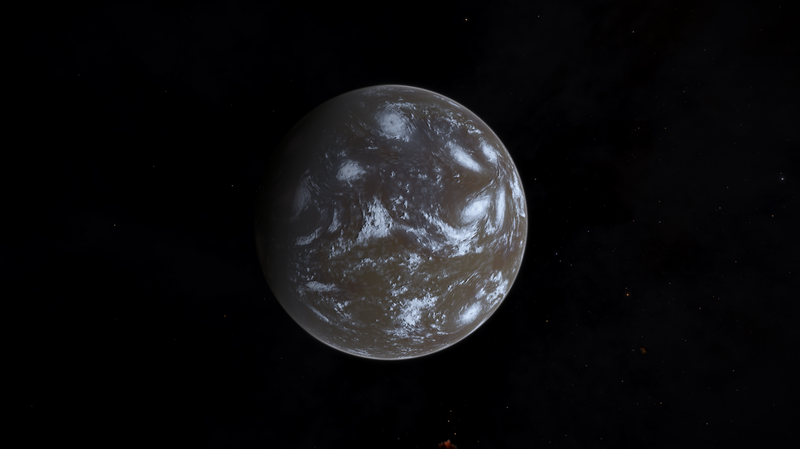 It is one of these bodies that makes exploration more profitable as it is a candidate for terraforming; although a few thousand Ly out from the bubble, I don't suspect it will happen in our lifetime! 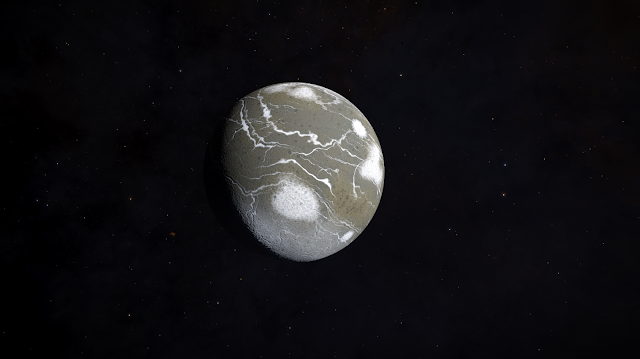 Unusual - will be worth exploring when we can land on planets with an atmosphere in the future. 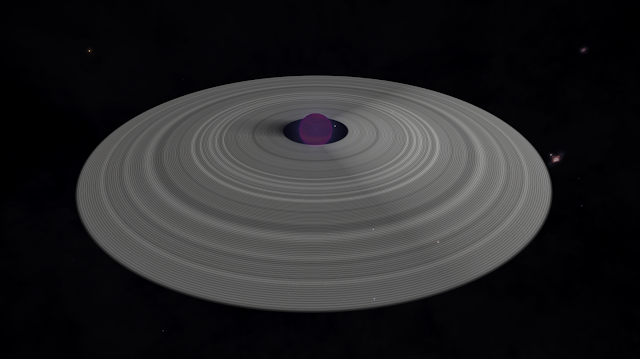 And finally.... a small dwarf sun with perhaps the largest set of rings I have seen so far. I was tempted to get a screen shot from inside the rings, but that has been done many times before and perhaps would not have conveyed the size of the rings surrounding this sun.